Let there be light! 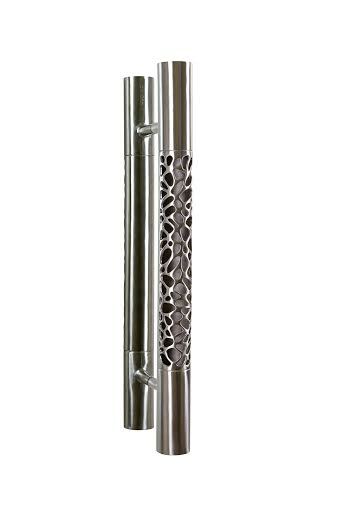 We will be hoping to light up our Morphic cylindrical pull with small LED lights placed inside the cylinder, and debuting this amazing piece at the 2014 HD Expo in Las Vegas. This new advancement will be so useful in nursing homes, hotels, and residences for not only the aging or impaired; but for anyone concerned about safety or for those looking to add something new and different to their project. We will also be releasing a new smaller Morphic pull in bronze and debuting this piece at the HD Expo as well. We will be very busy at the Expo this year introducing you to all these new products, including a new Ergo inspired lever that will function for a glass door. In most cases, lever style hardware does not work on glass doors as the latch has to pass through the door but we are in the process of developing a surface mounted latch that will enhance the beauty of your glass doors. Martin will be developing more of his art pieces. His paintings are fantasy pieces that depict imaginary insects with imaginary human figures and will be offered in limited edition prints or possibly giclees. Martin will also be moving forward with fantasy insect sculptures in bronze that will be released as limited editions. Very exciting! As mentioned above, we will be exhibiting at the 2014 HD Expo during the week of May 14-16th and will provide more information as to our location in the Exhibit Hall etc. in the coming weeks. This will be our fourth visit to this convention and we are looking forward to seeing old friends and making new friends. That is our year in a nutshell. What does 2014 hold for you and your business? If you would like to view our entire collection of custom architectural hardware and other products please visit our site at http://www.martinpierce.com. This entry was posted in architectural hardware, custom door hardware, custom hardware and tagged 2014 hd expo, architectural hardware, door hardware, door levers, led lit hardware, lever style hardware. Bookmark the permalink.